Search rental property listings near your School. Profiles of Students who are looking for a place to live. Post and Manage your Rental, Property Listings and/ or Banner Advertisements. Post, Read and Reply to Messages posted for your School. Products and Services for all your needs while attending College or University! Neither the State of Washington, nor any agency, officer or employee of the Community Colleges of Spokane: Spokane Falls Community College & Spokane Community College, warrants the accuracy, reliability or timeliness of any information published by Place4Students website, nor endorses any content, viewpoints, products, or services and shall not be held liable for any losses caused by reliance on the accuracy, reliability or timeliness of such information. Community Colleges of Spokane: Spokane Falls Community College & Spokane Community College, assumes no responsibility for contracts/leases between individuals. Community Colleges of Spokane: Spokane Falls Community College & Spokane Community College, is not responsible or liable for the consequences of any off-campus housing arrangement. In addition, Community Colleges of Spokane: Spokane Falls Community College & Spokane Community College, does not endorse or sponsor any of the agencies, services, advertisements, properties or landlords included in this website. The information is provided only as an aid in your search for housing. Students are under no obligation to use this service or rent from companies or individuals listed. Students are strongly encouraged to use due diligence and to obtain references and other information regarding listings and facilities. Portions of such information may be incorrect or not current. Any person or entity that relies on any information obtained from this system does so at his or her own risk. Places4Students.com has reached the milestone of 15 years in business. We would like to extend a warm Thank You to all the partners, students and landlords who have used this website and supported us in reaching this milestone! As part of our celebrations, we're giving away CASH! Learn more at 15th Anniversary Sweepstakes! The app is exclusively for students and aims to simplify the process for them to search for off-campus accommodations, roommates or sublets. It will also help landlords to connect with potential tenants more efficiently; as students can contact them directly through the app! Landlords will still register and manage their online rental listings through our website, not the mobile app. © 2003 - 2019 Places4Students.com. All rights reserved. 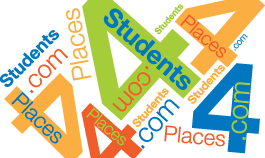 To use this website, the user acknowledges that Places4Students.com and/or the schools/institutions represented makes no warranties or validations regarding the content posted on this website. For more information, please visit our User Agreement. Never send money to a prospective tenant, even if they have sent you a money order and request funds be returned back to them. For more information, please visit our Fraud / Scam Alerts.